Hi! I’m Deb. I live in the northwest suburbs of Chicago where I decorate, paint, photograph, design things, and write about design from around the world. Many DIY projects that I share with you here have a global spin. 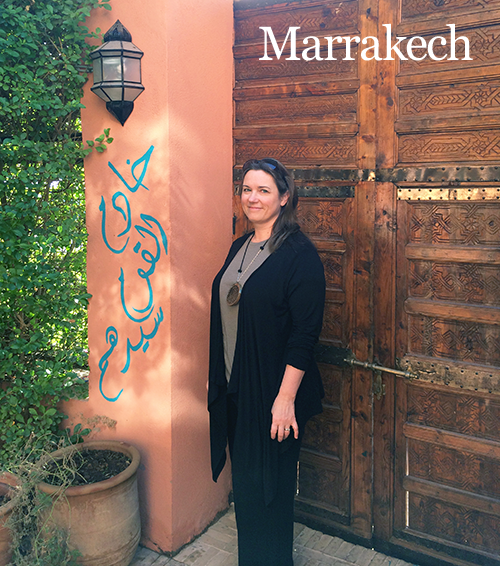 I was very happy to be in Marrakech! A design, decorating and shopping paradise! I may have bought a few dozen too many tassels. And India! If you visit around this blog, you’ll see I have close ties to India. Before this blog was called the Nomadic Decorator, it was called “India pied-à-terre*” for four years. This blog was originally about the construction and decorating of our “second home” apartment in Chennai, India. I’m interested in cultures and design from all around the world, and even our apartment in India is decorated with things from everywhere. So I changed the blog name to better fit what I share here. My true dreams — the things that I love to do — are always about travel, design and creating and making things. So I talk about that here at Nomadic Decorator. Design ideas and many DIYs that I share here are inspired by global style. And in our house, my decorating style is to mix up things from around the world. I’m lucky and grateful to have the chance to do decorating DIYs on opposite sides of the planet. 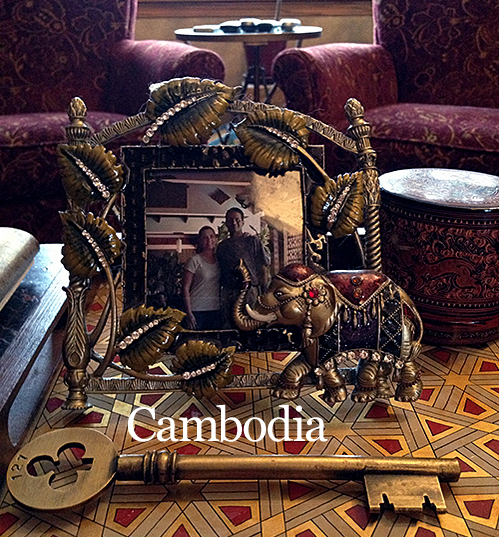 That gold skeleton key there is the actual key to the very special main door of the India pied-à-terre* — how cool a key is that?! * What is a pied-à-terre? Yeah.. I went to Vel’s website but it looks like its under construction. Any advice on how I should go about getting my Kitchen done before I contact Vel? No I’m not an interior decorator, just a hobbyist or very interested person for decades now! Here’s Vel’s site: http://www.velsinteriors.in/ which I can see right now. I really don’t have advice on getting a kitchen done before contacting them, because that is what they do — they can design and install a kitchen. So we are not doing it ourselves, as we cannot from such a distance — we are working with them to do the kitchen and bathrooms. I just wanted to add for the record here, in case anyone comes across this while researching Vel’s Interiors — we had problems with them and I do not recommend working with them. Hi there, I just found your blog and I love it. I moved to Chennai after I got married and though we already have our dream house, it really needs a make over, however, we have just started our business and are short of cash. So till we make enough money, I have been collecting bits and pieces of inspiration. Your blog really speaks to me and I’m going to be a regular here. Btw, there’s a similar door in my aunt’s house and it’s from an old temple. Is that similar to your? Thank you! I’m glad you found things you like here and are inspired. Hearing that makes doing this blog worth it. I’ve done the same thing for a long time — really, decades at this point! — collected inspiration until we’re able to do something with it. Hello m’am Deb. I note with interest your love for hand block print textiles. We are wholesalers /exporters of 100% cotton hand block printed ladies kurtis (tunics). I’ d love to talk to you. If interested you can email me on [email protected]. Thanks. Sorry it’s taken me so long to respond. But thank you for your comment!!!! & I couldn’t find an email to send this to, so I thought I’d write on your blog. Very fun and colorful! Let me know when you do this- send me a photo or your blog post!!! Deb-I love your eye for detail. I live in Chicago and am originally from India. It is stupid, but I have been so intrigued as well as felt excited at the same time that I have wished to see you in person. I do understand the space needed between virtual and real and therefore if it is an asinine request please ignore it. I love your page on pinterest and follow it all the time. Regards. Hi, thank you so much! I have met a few people “in real life” through this blog and am always happy to do so, some in the Chicago area too. Email me at india.pied.a.terre “at” gmail.com and we’ll see what we can do! I do keep myself more private online than many other bloggers, mostly because my purpose for this blog wasn’t to put myself out there publicly online. But it’s always fun to meet people with common interests here! Hi there, You’re an inspiration to me hearing about the travels. I love your idea about the dirt in the spice jars. Where did you find spice jars like that. I would like to find myself a set just like yours. HI Deb…..love your blog! We also travel to India (and other parts of Asia) and own an Asian Import Store in Orlando, FL. In fact, my husband will be in India on a buying trip next month. Check out Washburnimports.com. Also, our stores convert to bars at night (The Imperial at Washburn Imports or Imperial Wine Bar), as so many people wanted to rent them out for private functions. In person it’s much better than the website! If you make it to Orlando for any adventure, I’d love to show it to you. I love your style and sense of adventure. Hi! Glad I checked here, since WordPress on my phone never gives notifications to me anymore… Did you post the Chinese seal? I’d love to see. Ill send you a pic of the rings. I can’t wait to get sealing wax and see how they transfer. One of them rattles, like there’s something the size of a marble inside, and another huge trapezoidal shaped one has heft that makes me suspect its build over a wood frame. Love stuff like this, I could explore these shops endlessly! Hi there! First, I love your blog, you have done a wonderful job with it! Second, I am heading to India in 2 months and am on a mission to find things to decorate, decorate, and decorate some more! So, just a couple quick things. How have you gotten fabric/rugs/pottery back to the states? Second, how much would you pay for rugs and fabric? I know that is vague but maybe just give me a basic idea. Thanks so much for your help! Can you please something about http://www.tadpolestore.com, a review that can help people to know about Indian Designers products online. We haven’t talked since I moved to Chicago! Hoping we can get together before I move back to California. (I could drive north and meet you somewhere convenient for you…) and exchange info on indialove, working it on the internet, and other things of mutual interest. The Tiger’s Armoire is going to stay online for now, but…I still have hope for bricks and mortar. When are you next in Chennai? hi Nomadic Decorator. I found a fabulous set of black/white morroccan-style dinnerware, and my 86 year old mother would love them!! I tracked them back to your site. Do you know what I’m referring to? If so, how can I purchase a set? Please let me know. Thanks so much. I have just found you and I love your blog. More, I am loving the metal printing blocks you show here..love them….is there somewhere I can buy these lovelies? I also love that door, WOW…beautiful. Thanks brother very good site i like your blog! and welcome to my new site ! I am very much interested in Jewelery. I saw on the google some staff….what are you having? May you send as well abroad? To Switzerland_? LOVE the designs! Was looking for some stencils when I came across these! I may have some pieces I want to stencil later and would like to ask your advice when I get ready. Would that be ok? I stumbled upon your blog and thought of connecting. Having started Amouve, the first-of-its-kind certified organic bedding brand in India (www.amouve.com) I’d love to connect with you to see how we can work together. I did drop you a mail. If it interests you, please do let me know. Hello, I just saw this image on Pinterest linked to your website but I can’t seem to find it on your site. I would love to know who the artist is of that painting. It is absolutely stunning. This is a treasure-trove of ideas! FB posted an expanded photo of your top DIY stencil photo of the Moroccan enclave (blue wall, shutters, blue stenciled pillows)…and a curtain/drape. It’s just stunning. Where did you find it? 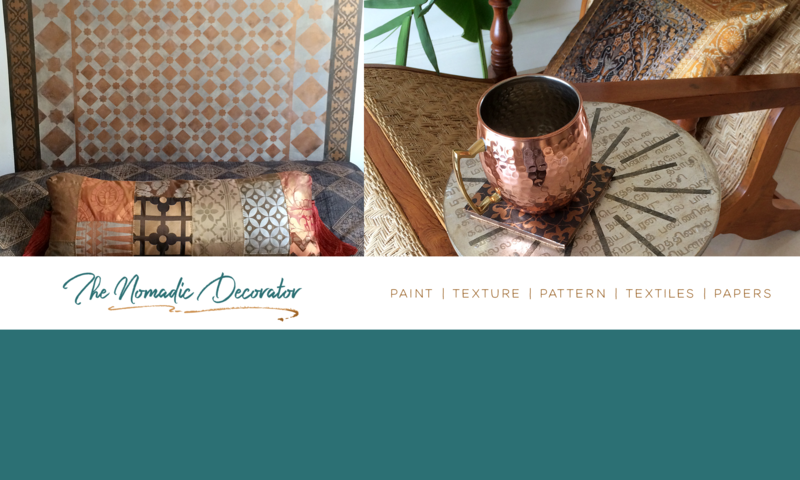 Also, I spend a lot of time in Morocco and want to incorporate the colours and homestyles in my new place…suggestions? I can buy fabric etc the next time I’m there. Hi Debi… I just found your incredible blog! I raced to sign up…I was instantly, overwhelmingly inspired! I would consider myself somewhere in between an advanced beginner to an intermediate in the arts of home decor, paper crafting, DIY and crafting. I have been a seamstress for years, specializing in home decor sewing; drapes, bed linens, pillows and nursery decor. I also sew formal sorority dresses for several sororities at the local university. For some reason I never had the confidence to try my hand at anything else, I assumed I would fail miserably. Recently, I’ve developed an interest in making decorative fiber tassels, I’ve found it a bit challenging. I’ve looked at your tutorials and I think I CAN make these…with your help. One would think with all of the huge chunky traditional drapery tassels I’ve made, other tassel making would be easy. Not so, the construction of drapery tassels is a completely different science, not calling for too much creativity. I prattle on; I’m so excited to have found a kindred spirit in you, I couldn’t let it go without telling you. Your artistic eye and wild creativity is magnetic! Have a peaceful evening. 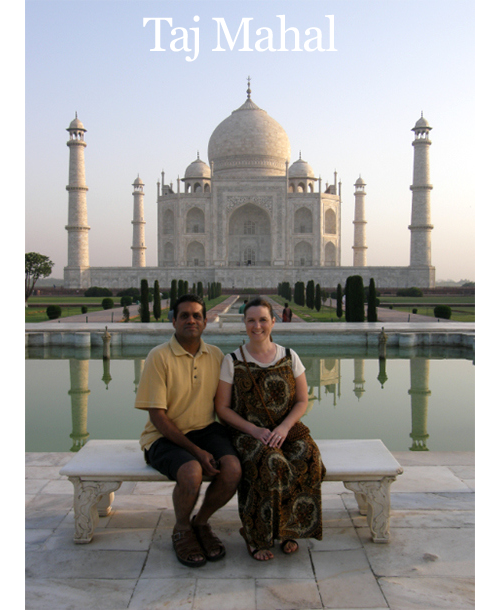 I saw your Pinterest group Patterns of India and landed on your blog. You have a keen eye for designs, patterns and palettes, so obviously your posts are very impressive. I run a Lifestyle, culture and travel blog, and was wondering if I could contribute to your Pinterest group. If you think that is feasible, please let me know the group rules. Either way, keep up the great work. Hi Somali, thank you so much! Please send an email to me at [email protected] with the email address that you use for your Pinterest account. Then I can add you to the Patterns of India group with your email address. Hi Deb, Had a read though your Silk stencilling project and it’s really impressive. I am planning for such a project and hence forth I have some questions to you. Also, I recall you said about slippery silk surface. Why didn’t you use a adhesive film. I have done a couple of stencilling work on a a cotton cloth and I am pretty happy about it and I want to transform it to a silk fabric and hence any lessons learn from you is highly appreciable. I had one failure using a PP Poly Polypropylene sheet as there was excessive bleeding and hence I want to use only a 10mil Mylar sheet. Hi Vinodh – I do not use paint rollers for stencils because it is too easy to load too much paint on a roller. And it’s too easy to push too hard over a stencil with a roller. When there’s too much paint, paint will bleed under the stencil and make messy blurry edges on the design. Some people can use foam rollers and get good results. I personally get better results with a brush. But everyone paints different and a foam roller might work okay for you. I’d suggest to do a sample first on extra fabric — try both a roller and a brush and see which works best for you. I think bleeding is caused by having too much paint on a brush or roller, more than the thickness of the stencil sheet. The brush or roller should have only a very small amount of paint, like they should be almost dry, for best results with stenciling. I find it’s easier to control the amount of paint when you use a brush than a roller. Although it takes longer to stencil with a brush than a roller. I did not use adhesive because I didn’t want to risk the adhesive damaging the silk fabric. I think all I had available when I did that project was a strong adhesive, and I didn’t want to run to the store for a weaker adhesive! :) Again, you can test adhesive on scrap silk fabric and see what happens.